We whip out our phones to snap photos of our kids, our pets, the coffee we’re about to enjoy, and sometimes a gorgeous view that takes our breath away. For the most part those photos live on our phones, the lucky ones waiting to be turned into photo books. Other times we share them on various social media sites. Most people don’t expect their hastily snapped iPhone photo to end up on the front page of multiple national newspapers. 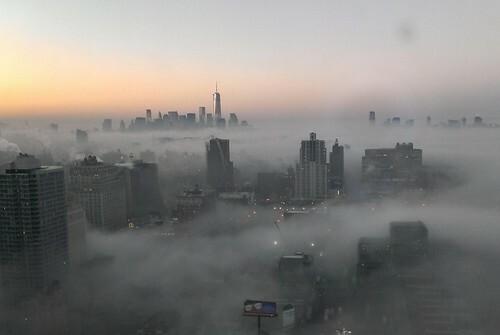 And yet, that’s exactly what happened when Girish Tewani woke up one morning in his 48th floor New York City apartment and grabbed his phone to capture the view of the fog rolling over the city. His wife loved the photo he snapped with his iPhone and uploaded it to Instagram with a few well chosen hashtags. Minutes later a photo editor from the Associated Press was calling to see if they could see the original photo. Before long the photo was purchased and on its way to many major publications. It just goes to show that you never can tell what gems you might capture with your phone… or how many people you might reach with your photos.